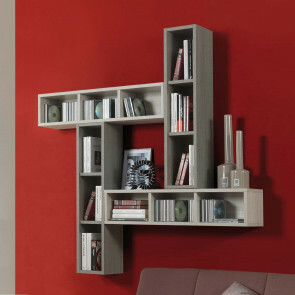 Link Free is a metal modular bookcase with wooden shelves available in different finishes. It allows to compose wall bookcase or partitions with storage units, desks, drawers and magazine racks. 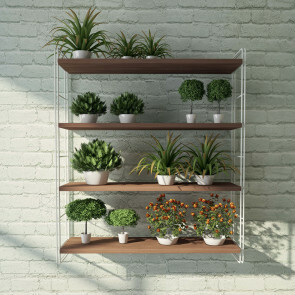 Mini Link is a shelving system in metallic wire with shelves in coated wood both hygienic and practical materials. The set is available with 3 or 4 shelves, perfect for the bathroom, kitchen or balcony. Link Living is a wall modular bookcase which can be used as a partition; it can feature storage units, drawers, desk and table. Structure also available floor standing or fastened to the ceiling. Link Night is a bookcase for kids bedrooms with built-in desk, storage units and drawers. Highly customizable it is composed of metal columns which can be equipped with shelves and other accessories. 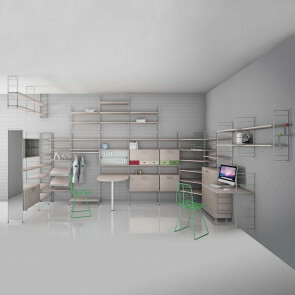 Link Office is a modern metal shelf unit for offices, professional studios, stores and stands. High modularity, floor standing, wall or ceiling mounted; it includes shelves, columns, desks and accessories. Link is a double-sided partition bookcase with built-in peninsula table. Available also without table, in endless custom compositions. Ideal to circumscribe, divide and furnish the living or home office area. Evolution E05 wall mounted small bookcase is a storage bookcase with back, available in 5 finishes. It can be used as a single element or inside customized compositions.